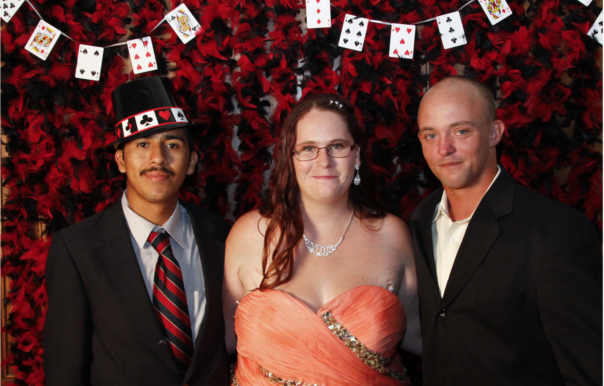 We team up with LifeWorks to offer a Second Chance Prom each year to all our clients. This is so inspirational for them! They get dressed up, pose for portraits taken by a professional photographer (as above), are treated like prom royalty, and walk taller and prouder for weeks afterwards. Your assistance is pivotal! 2. A Christmas to celebrate! Our end-of-year celebration of Christmas was fabulous. 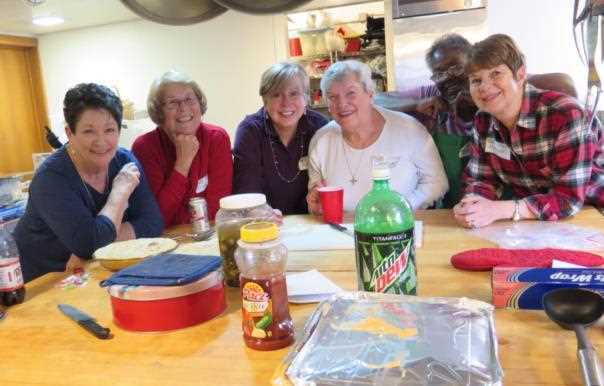 Forty-one clients and 30 volunteers -- including the happy kitchen crew above -- gathered to celebrate the coming of Jesus. We were hosted by the Daughters of the King from All Saints Episcopal Church. We celebrated a lot of amazing accomplishments by our clients, including moving into apartments, having healthy babies, getting jobs, being sober, going to college and more! 3. A safer arrival for babies! 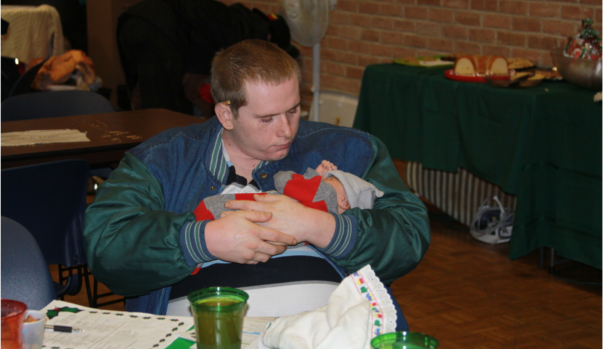 Deon, above, holds one of our newest SYM clients. Her mother got off the street quickly once she learned she was pregnant. When we became aware of high miscarriage and infant death rates among our pregnant clients, we focused on the problem. We raised awareness. We asked them to count the number of months they spent on the street, and work to reduce that number. Several of our clients moved back home, got jobs, and found prenatal care. When their babies arrived, there was room and love for them! We were blessed to have two summer interns this year! Jared Dale and Matthew Powell were our high school interns. They learned to interact safely with clients, operate our many events, and master the fine art of logistics! Read about our internships and pass the word to mature high school juniors. Our weekly stipend is not a lot, but it's enough to keep one from needing a second job. This year, LifeWorks, SYM and University Presbyterian Church combined forces to throw an awesome Halloween party for our clients, complete with costumes, face painting, treats, grilled burgers and hot dogs, and a raffle. We were joined by UT student athletes from many sports. They painted faces, played Jenga and other games, and drew prizes for our raffle. In the photo, a client challenges a UT student to a game of bean bag toss. This year we partnered with LifeWorks and ECHO on a 100-day challenge to house as many street-dependent youths under age 25 as possible. Our role was to make sure clients completed the application form and 27 of our clients from the West Campus streets did so! Each youth in the photo and many others were placed into apartments. If they meet the criteria and become able to pay rent, they will be able to remain there! Darvin Tan started with SYM as an intern in 2015, and he discerned that his calling was to stay. However, he didn't have a visa. We applied for a religious work visa for him and, amazingly, received very rapid approval! Darvin is key to keeping our ministry working smoothly. Darvin staffed our annual Turkey Grab, something we do for clients who have recovered from the street every year so they can serve others with a homemade meal. Darvin posed at left with turkey donors from Mothers of Professional Football Players. Our clients have always wanted access to a clean and safe shower. We were blessed to receive an invitation from University Presbyterian Church to use its fellowship hall, including shower, once a week. We equipped the room with computers so waiting clients can do other things. We also provide access to piano and guitar. Nothing like hanging out after a nice, refreshing shower! In the photo, a client and a volunteer share an interest in drawing. In October, we learned of a new opportunity for a permanent home for SYM. We forged a much-expanded alliance with Congregational Church of Austin to utilize its basement as a new Drop-In Cooperative center, where clients can get safety net services, receive guidance counseling, and learn soft life skills for jobs and apartment living. We also expanded our partnership with LifeWorks, which will provide counseling, case management and group support in our Drop-In Center. The photo shows leaders of the three organizations. 10. Clients come inside to enjoy Showtime! This summer was quite hot, and we had a wonderful invitation from long-time partner St. Austin's Parish Church to use an air-conditioned fellowship room to give our clients a break. Together, we watched two movies each Friday afternoon and shared snacks and dinner together. It became one of our most popular indoor events! Clients surprised us with their movie choices, such as "Homeward Bound," "Hairspray," and "Daddy's Home!" 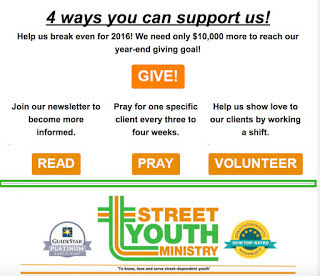 4 ways you can support us! Help us break even for 2016!We need only $10,000 more to reach our year-end giving goal! Pray for one specific client every three to four weeks. Help us show love to our clients by working a shift.